Federal Government has decided to launch operation against the protestors at D-Chowk, Islamabad, if negotiations fail, Waqt News reported. The operation is expected to be conducted tonight. The government has nominated Jamaat-e-Islami (JI) Chief Siraj-ul-Haq to lead the negotiations with the protestors. “The government has decided that protestors will be offered negotiation at first,” sources told Waqt News. “Then a warning will be issued to the protestors to vacate the D-Chowk. Then the water cannon, tear gas shelling and rubber bullets will be used as the last resort”. According to reports the negotiation team will include renowned Ulema of the country. Additional security personnel have been called to Islamabad for the expected operation, sources revealed. Almost 300 people have already been arrested for destroying national assets. Rangers have also been summoned. 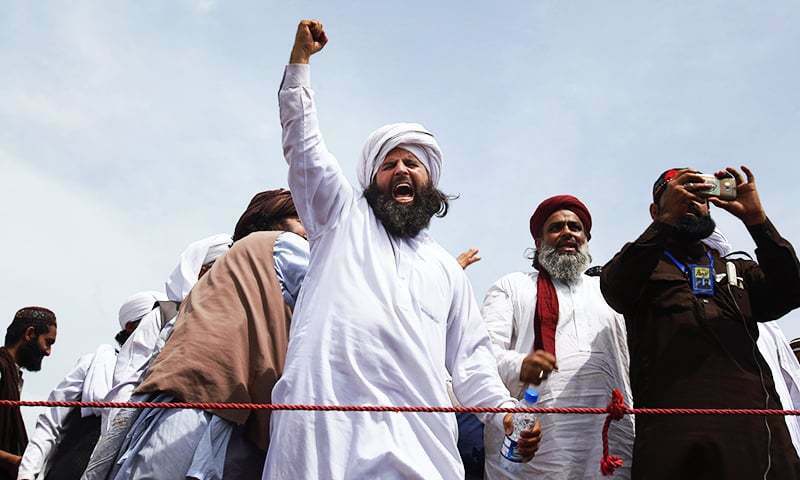 The protestors clashed with the police on Mumtaz Qadri Chehlum on Sunday. Their sit-in in the Red Zone of Islamabad has now entered its third day. They protestors have presented 10 demands, which include official recognition of Mumtaz Qadri as a martyr by the state. Since Sunday the rioters have destroyed a Metro station, seven containers and one CDA car.